A Total Nail Avulsion (TNA) is a minor surgical procedure undertaken in order to remove the entire nail plate and matrix (root). If phenol is used during the procedure then the nail will not re-grow. This method of removing the nail and preventing it from re-growing is perhaps the least invasive of all the procedures used to remove toe nails and prevent their re-growth. The technique does not require stitches and the level of post operative discomfort is minimal. Additionally the post operative aesthesis is very good in comparison to other methods used to remove toe nails (many surgeons still undertake a ‘ Zadiks’ procedure which is far more invasive, will often result in small and unsightly stubs of nail re-growth, and has a lower level of patient acceptability). 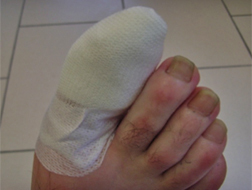 A toe nail that has been damaged may become permanently thickened and deformed making it both unsightly and likely to rub against the toe box of footwear. This will often result in the formation of:  recurrent haematomas (blood blisters) under the nail, ulcerations under the nail, possible corn/callus formation under the nail, possible bacterial and/or fungal formation under the nail,  discomfort under the nail. A Total Nail Avulsion can be considered for patients with a combination of these factors. The procedure involves ‘peeling’ the nail plate and matrix away from the nail bed. Phenol is then applied to the exposed nail bed. Phenol is used to destroy the cells that surround the matrix thus preventing the matrix from re-establishing itself and thus preventing new nail formation. Post operatively the area is relatively pain free (Phenol also has an analgesic effect on the exposed nail bed). Since Phenol is a caustic the area will be quite inflamed for a few weeks although providing patients avoid any footwear that is likely to rub the toe then this should not impact significantly on their daily activities. Patients are requested to avoid unnecessary weight bearing for the rest of the day with most patients able to return to work the following day, although it is advised to avoid prolonged weight bearing for 2-3 days. The majority of TNA’s undertaken at our Practice do not even bleed post-operatively which is testament to the vast experience and proficiency of our Nail Surgery Specialist, Mark Hollinshead. Mark set up and ran a unit within the local NHS Community Trust for 11 years that specialised in toe nail surgery. During which time he undertook thousands of toe nail surgeries gaining a reputation for excellence in this field. The fee for a Total Nail Avulsion is £225 which includes all follow up dressing appointments and the provision of all dressings.